The ASHRAE Advanced Energy Design Guide for Small Retail Buildings is the second in a series designed to provide recommendations for achieving 30% energy savings over the minimum code requirements of ANSI/ASHRAE/IESNA Standard 90.1-1999. The energy savings target of 30% is the first step in the process toward achieving a net zero energy building, which is defined as a building that, on an annual basis, draws from outside resources equal or less energy than it provides using on-site renewable energy sources. ANSI/ASHRAE/IESNA Standard 90.1-1999, the energy-conservation standard published at the turn of the millennium, provides the fixed reference point for all of the Guides in this series. The primary reason for this choice as a reference point is to maintain a consistent baseline and scale for all of the 30% AEDG series documents. This Guide focuses on small retail buildings, which make up the bulk of the retail space in the US. These buildings use unitary heating and air-conditioning equipment and are limited to 20,000 ft² in size. The recommendations in this Guide will allow those involved in designing or constructing small retail buildings to easily achieve advanced levels of energy savings without having to resort to detailed calculations or analyses. All of the energy-saving recommendations for each of the eight US climate zones are contained on a single page, thus facilitating the Guide's use. Additional recommendations point out other opportunities to incorporate greater energy savings into the design of the building. Those looking for some help in implementing the recommendations of this Guide will find an expanded section of tips and approaches in the "How To Implement Recommendations" chapter of the Guide. To further facilitate its use, the Guide cross-references the how-to information with the numbered tips and the color-coded climate zone maps. Examples of advanced building energy designs are also provided to illustrate the points made and to demonstrate the flexibility offered in achieving the advanced energy savings levels provided within the Guide. This Guide was prepared under ASHRAE Special Project 110. 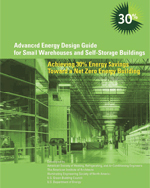 For more information on the entire Advanced Energy Design Guide series, please visit ashrae.org/aedg. 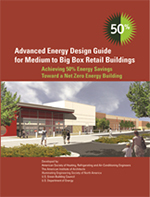 To promote building energy efficiency, ASHRAE and its partners are making the Advanced Energy Design Guides series-including Advanced Energy Design Guide For Small Retail Buildings-available for free download (PDF).